There is an ever growing range of footwear choices out their for runners. Companies will offer new technologies and gimmicks to draw interest and curiosity in order to sell their shoes. A pronation control device or increased heel-to-toe differential may well alleviate pain and allow you to run again. This is important and if the shoe fits, go for it but understand that this is a short-term solution and you need to fix why it is that you require that support. This isn’t about running barefoot but if you can run barefoot well and pain free then you can assume you have good foot function. The foot is important, with it’s 26 bones and 33 joints it was designed to be a shock absorber, force transducer and function as a spring on toe-off through tension of the fascia via the windlass effect. The design was perfected through evolution and doesn’t need to be improved – It can’t be improved. Why are we injured then or suffering pain up the lower limb if the structure hasn’t changed? It’s because we have lost its function. Growing up with stiff and heavy shoes, encasing them tightly around the forefoot, providing them constantly with support weakens their function. Knowing this there is no wonder why we require additional external support. If this is you, then go for the motion control shoe to keep you running… for now. But work on restoring foot function in the meantime. We need to understand that prolonged support weakens foot function and weakness in the foot can track up the chain and affect the knee, hip and back. At the end of the day you if you have to and need to run, wear the shoe that allows you to do that but have a strategy to restore or optimize function. I don’t push a certain shoe because their will never be a perfect shoe for every body. 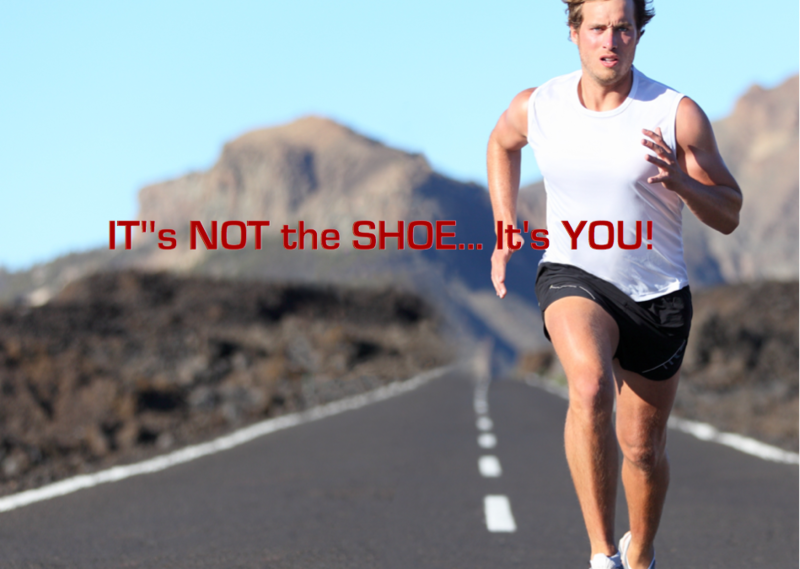 It’s not about the shoe, it’s about the foot inside it and how the rest of the body above it is functioning. As your function improves your shoe requirement will change to a lighter, flexible and less supportive shoe. Your foot will get stronger and support is inbuilt. In the same way their will never be a blanket mobility or stability exercise prescription (unless you spend hours addressing everything – the shotgun approach) because different people have different dysfunctions. Many runners may have ‘runners knee’ but this isn’t a diagnosis. You can arrive at ‘runners knee’ with dysfunctions in the foot, ankle, knee, hip and core. Which one is it? Get it assessed by a professional. I met a progressive thinking podiatrist at a summit in Melbourne www.therunninglab.com who delivered the same message. His site has great resources and programs for optimizing foot function that I highly recommend. It’s not the shoe, it’s you!